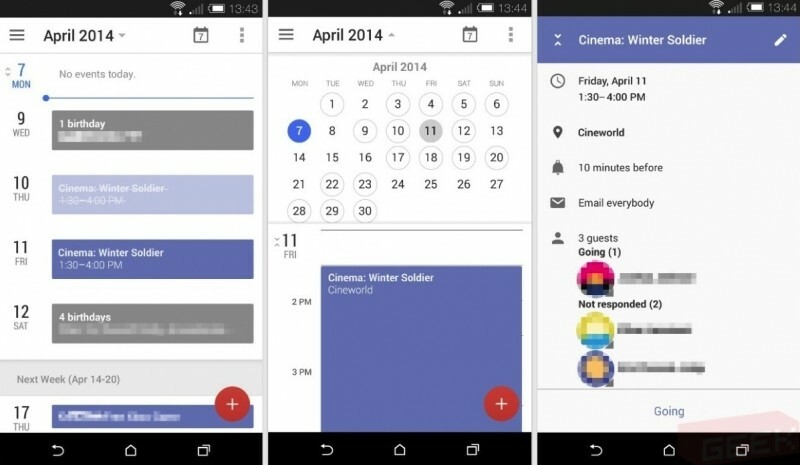 Google is testing out new features and UI elements for its Calendars app on Android, according to a report from Geek.com. After recently reporting on a new version of Google's Gmail for Android app, we now have images and details about new additions possibly coming to Google's Calendar app as early as the I/O event this June. Among a few new features mentioned, the report also shows images (above) of what appear to be a much cleaner UI than we are currently used to. There's no more of those grid lines separating dates and appointments, the Google Calendars team is currently trying out a color block system instead and the results appear to be quite successful at this point. As you likely imagined, the next Calendars refresh will continue Google's push to integrate its services with Google+. Users will have the option to have the entire day's schedule automatically emailed to them from Calendars without opening the app, along with other email reminders like Birthdays, based on information from Geek.com. Other features from the report mention a stylized parallax-like scrolling effect when flipping through months, as well as other visual flares that couldn't be captured in a still screenshot. The report also mentions that the refreshed app seemed like it was ready for the public but that it definitely wasn't a final version and likely to change before it becomes one.